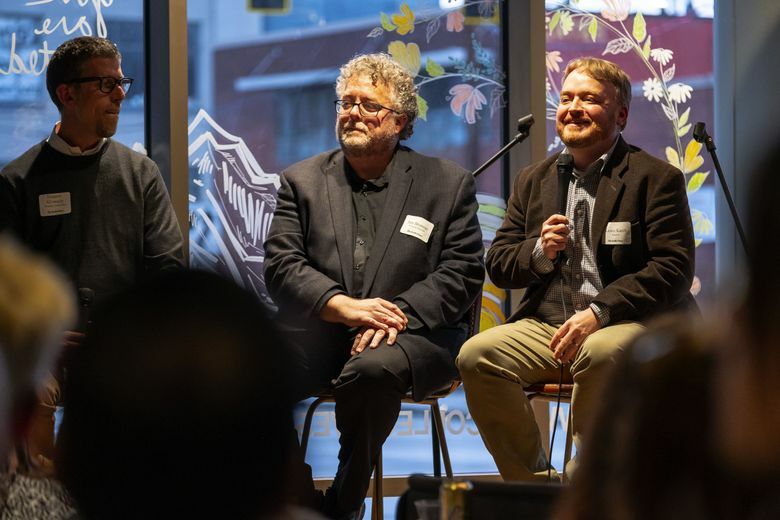 About 120 readers and Seattle Times staff attended the launch event for The Seattle Times Investigative Journalism Fund on Thursday, an innovative community-funded initiative with the Seattle Foundation to support investigative journalism. During the event, Seattle Times reporters Jim Brunner and Lewis Kamb discussed how their 2017 investigation into child sexual-abuse allegations against then-Seattle Mayor Ed Murray came together. The discussion highlighted the kind of in-depth, watchdog journalism the new fund would support at The Times. The Times is aiming to ensure the future of local investigative journalism and protect and expand the ambitious, rigorously reported work that is critical to a healthy democracy by seeking out community funders and personal champions of a free press. The Investigative Journalism Fund builds on the success of three community-funded initiatives covering education, transportation and homelessness — Education Lab, Project Homeless and Traffic Lab — but is the first to seek funding from readers. Thursday’s event raised about $26,000. In-depth investigations have helped earn The Seattle Times 10 Pulitzer Prizes, more than any other news organization in the Northwest. The Times is one of the few remaining independent, locally owned news media organizations in the U.S.